With an area of 285 rai (or 14 acres), the Center is located in Tambon Chang Yai, Amphoe Bang Sai. Farmers from Ayutthaya and other nearby provinces promote and display local arts and crafts here. At this center, you will have a glimpses of how farmers in the 4 regions live and work; how their products of arts and crafts are produced. Products and activities which can be seen here are fern vien basketry, weaving basketry, artificial flowers, hand woven silks and cottons. 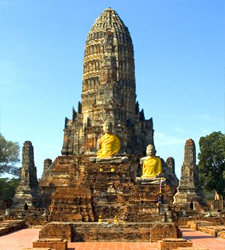 One of the loveliest and historically important temples in old Ayutthaya. Its three large chedis and numerous smaller ones make this wat - also known as the King's Temple - one of the most impressive sights in the ruined city. Certainly one of the most modern buildings in Ayutthaya, the museum was founded by King Bhumibol Adulyadej in 1961. 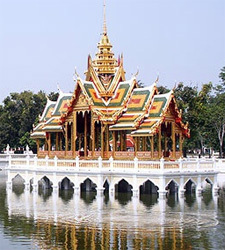 It houses a number of sculptures and works from different periods throughout Thailand's early history. The two main highlights are a seated Buddha and a huge bust of the Buddha in the U Thong style. This impressive temple, in the east part of the city, has a massive chedi surrounded by four smaller ones all on a square base. Built in 1357 it was assigned to a particularly strict order of monks trained in Ceylon, many of whom still live there. Tourists can bond with one of Thailand's most revered animals by spending a few days at the Elephant Stay. The minimum booking is three nights, and includes an elephant you'll care for throughout the duration of your stay - guests feed, bathe, and ride their assigned elephants. The non profit organization is devoted to conservation and supporting retired elephants. In addition, the organization has a very successful active breeding programme.